John O’Regan wins another 24 hour race in a rain soaked Bangor. Our man, John O’Regan has successfully defended his Energia 24 hour race title in Bangor, clocking up an impressive 129 miles. As a sponsor, we are extremely proud of his achievement. Read the following press release for more details. 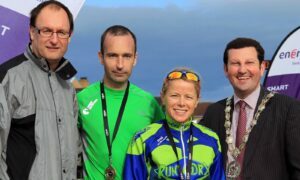 “John O’Regan,42, from Leixlip in Kildare won the Energia 24- Hour race in Bangor at the week-end for the second year – and he survived 16 hours of torrential rain to achieve it covering over 129 miles. The expected battle with Irish 24-hour record holder Eoin Keith,43, from Kerry evaporated as Keith was advised on medical grounds to stop after 65 miles because of a stomach bug that was sapping his energy. “ I owe the race and the race owes me,” he was left saying. And, disappointed double world record holder Sharon Gayter,48, from Teeside who was expected to beat all the men was also gone before dawn. Chilled to the marrow, her muscles refused to cooperate. She had been looking to post a big distance to impress the GB selectors – but will now just have to wait to see if she is still selected for the World Championships in Poland in September. So, it was left to a virtual unknown, Austrian Thomas Bubendorfer,42, now living in Kerry, to emerge to challenge O’Regan. He had never gone more than 50 miles before, but he remained strong throughout, posting some 126 miles for second place just 3 miles behind O’Regan. Madrid-based Eddie Gallen, who has just joined Finn Valley AC, tried to go with the Austrian but, despite never leaving the track, had to settle for third. Aisling Coppinger,40, from Enniskerry in Wicklow, proved another surprise package. The joint owner of Wheelworx in Dublin, had also never gone beyond 50 miles – but the former European Mountain Running Champion doubled that –collapsing from the effort at the finish to win the women’s race and with it the Irish title. Some 7 runners went beyond the magical 100 mile mark. The 12-hour race was won by Dubliner Sean Burke,42, who covered some 65 miles in that period. And, there was a record in the 24-Hour relay race won by Kildare outfit Donadea Running. The team of 4, including last year’s women’s overall winner Deirdre Finn, clocked up 181 miles to beat Orangegrove AC’s record mark of 170 miles set last year. Orangegrove were just shy of that mark this time.